Bring in the New Year with a BANG! The party starts at 8:45 p.m. with shuttle pickups beginning at 8:00 p.m.
Bring 2007 to a fabulous close with a night of laughter, delicious food and an experience you won't soon forget! 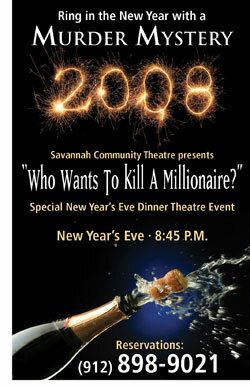 Click here for more details about Savannah Community Theatre's New Year's Eve event. Call (912) 898-9021 for reservations or buy your tickets online now.